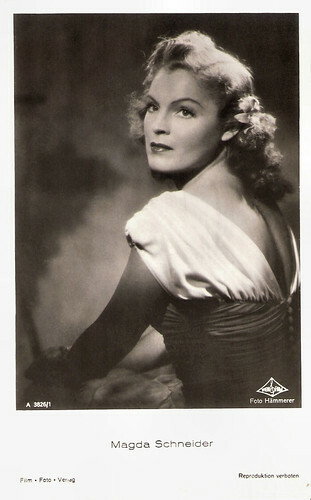 German singer and actress Magda Schneider (1909-1996) is best known as the mother of film star Romy Schneider, but in the 1930s, 1940s and 1950s, she herself starred in some 40 films. 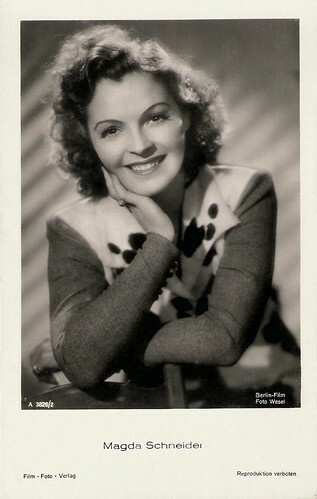 First she appeared on the screen as a charming Wiener mädel (girl from Vienna) and after the war she often played the understanding mother or aunt. German postcard by Ross Verlag, no. 6561/1, 1931-1932. Photo: Atelier Schneider, Berlin. German postcard by Ross Verlag, no. 6817/1, 1931-1932. Photo: Studio Lenné, Berlin. German postcard by Ross Verlag, no. 7099/1, 1932-1933. Photo: Atelier Casparius, Berlin. German postcard by Ross Verlag, no. 7099/2, 1932-1933. Photo: Atelier Casparius, Berlin. German postcard by Ross Verlag, no. 7415/1, 1932-1933. Photo: IF. 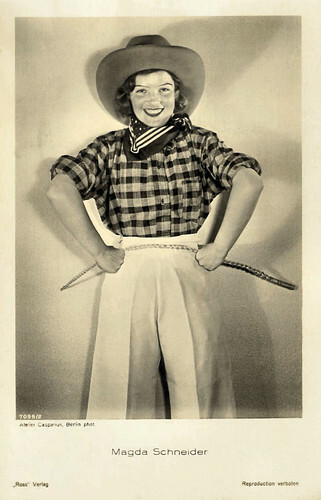 Publicity still for Marion, das gehört sich nicht/Marion, That's Not Nice (E.W. Emo, 1933) with Otto Wallburg. German postcard by Ross Verlag, no. 7930/1, 1932-1933. Photo: Atelier Binder, Berlin. Magdalena Schneider was born in 1909 in Augsburg, Germany. She was the daughter of a plumber, Xaverius Schneider and his wife Maria Meier-Hörmann. After visiting a Catholic girl’s school Magda studied stenography and office management at a business school and worked as a steno typist for a grain merchant. In her leisure time she studied singing at the Leopold-Mozart-Konservatorium Augsburg and followed ballet classes at the Stadtheater of her native town. 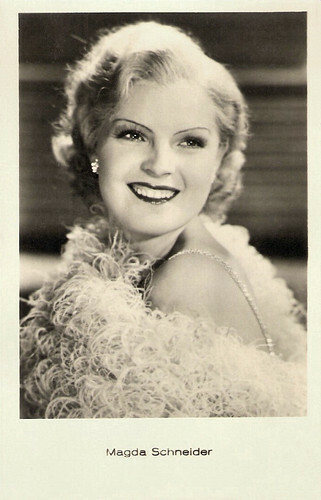 As a soubrette she made her debut in the operetta Die Fledermaus (The Bat) and played several parts in comedies in the Stadttheater of Augsburg and later also in the Staatstheater am Gärtnerplatz in München (Munich). There she was discovered by director Ernst Marischka, who invited her to work for the Theater an der Wien. 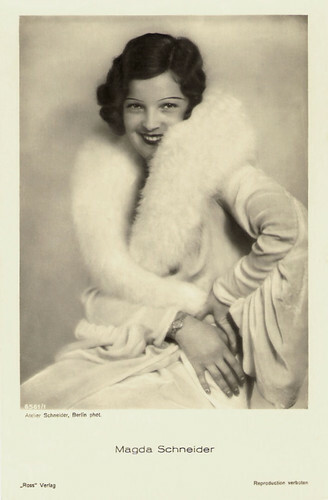 In 1930 she made her first film appearance in Boykott/Boycott (Robert Land, 1930) with Lil Dagover. 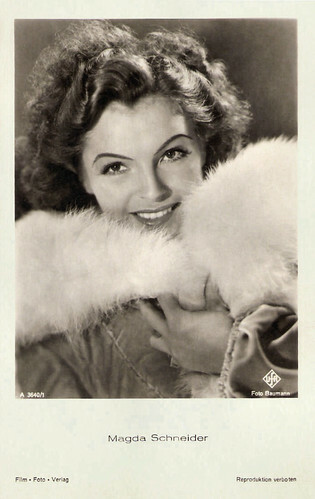 Two years later she launched her film career after a film test at the Ufa studio. 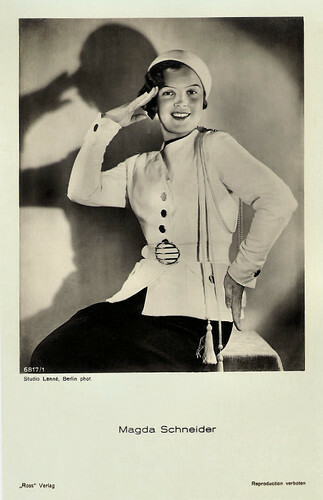 She could be seen singing and dancing in such films as Zwei in einem Auto/Two in a Car (Joe May, 1932) with Kurt Gerron, Das Testament des Cornelius Gulden/The Testament of Cornelius Gulden (E.W. Emo, 1932) with Georg Alexander and Theo Lingen, Das Lied einer Nacht/Tell Me Tonight (Anatole Litvak, 1932) at the side of the star tenor Jan Kiepura, and eventually the poetic masterpiece Liebelei/Flirtation (Max Ophüls, 1933) co-starring Paul Hörbiger. Liebelei, based on a play by Arthur Schnitzler, was one of her best films in which she could unfold her whole acting talent. 25 years later, her role in Liebelei was played by her daughter, Romy Schneider, in the film Christine (Pierre Gaspard-Huit, 1958). German postcard by Ross Verlag, no. 146/1. Photo: Cine-Allianz-Film der Ufa. 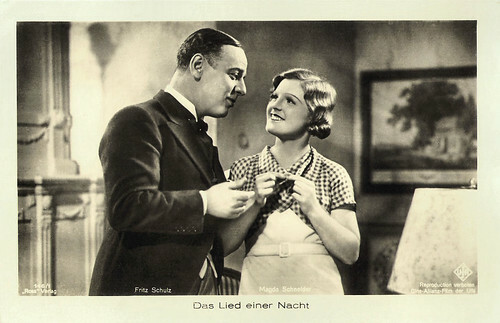 Publicity still of Fritz Schulz and Magda Schneider in Das Lied einer Nacht/The Song of Night (Anatole Litvak, 1932). Dutch postcard by JosPe, no. 441. Sent by mail in 1933. Photo: City Film. Dutch postcard by JosPe, no. 397. Photo: City Film. 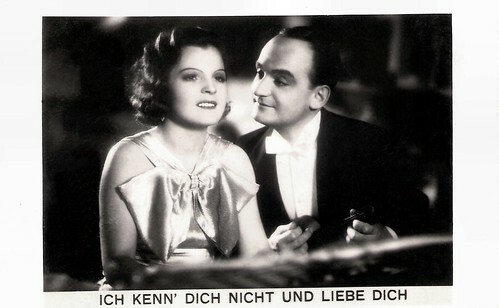 Publicity still for Ein bißchen Liebe für Dich/A Bit of Love (Max Neufeld, 1932) with Georg Alexander. 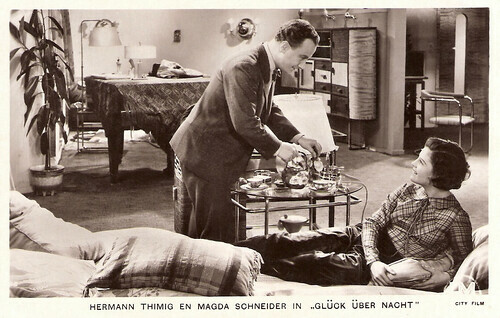 Dutch Postcard for Glück über Nacht/Happiness Over Night (Max Neufeld, 1932) with Hermann Thimig. Photo: City-Film. Notice the modern furniture & set design. German postcard by Ross Verlag, no. 8843/1, 1934-1935. Photo: Badal Filmproduktion. Publicity still for Fräulein Liselott/Miss Liselott (Johannes Guter, 1934) with Albert Lieven. British postcard. Photo: publicity still for Ich Kenn Dich Nicht Und Liebe Dich/I Don't Know You, But I Love You (Géza von Bolváry, 1934) with Willi Forst. 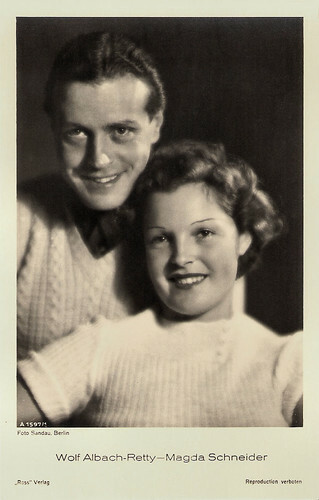 During the production of the film Kind, ich freu mich auf dein Kommen/Child, I please me about your arrival (Kurt Gerron, 1933), Magda Schneider met her first husband, actor Wolf Albach-Retty. 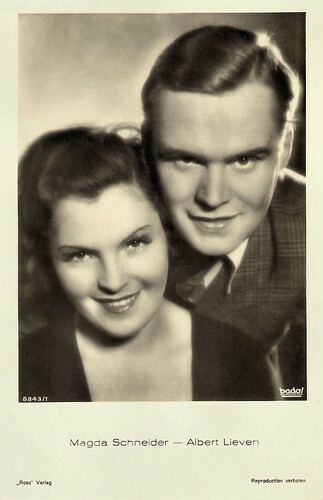 They appeared in eight films together, including G'schichten aus dem Wienerwald/Tales from Vienna Woods (Georg Jacoby, 1934), and Rendezvous in Wien/Rendezvous in Vienna (Victor Janson, 1936). The couple married in 1937 and would have two children, Rosemarie Magdalena, called Romy (1938-1982), and Wolfgang Dieter (1941), later a surgeon. The couple divorced in 1945 (some sources say 1946, others 1949). 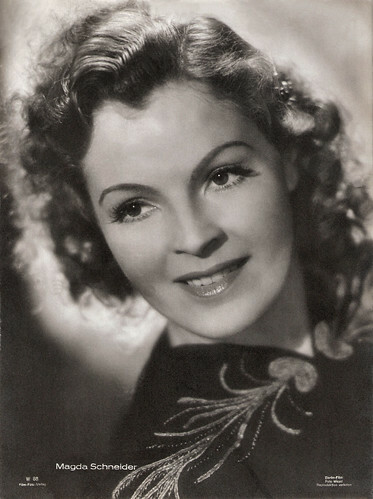 Other films in which Magda appeared during the 1930s and 1940s were Eva (Johannes Riemann, 1935) with Heinz Rühmann, Frauenliebe – Frauenleid/Woman’s Love – Woman’s Sorrow (Augusto Genina, 1937) with Iván Petrovich, and Liebeskomödie/Love’s Comedy (Theo Lingen, 1942). German postcard by Ross Verlag, no. A 1597/1, 1937-1938. Photo: Sandau, Berlin. With Wolf Albach-Retty. German postcard by Film-Foto-Verlag, no. A 3640/1, 1941-1944. Photo: Baumann / Ufa. German postcard by Film-Foto-Verlag, no. A 3826/1, 1941-1944. Photo: Hämmerer / Wien Film. From Tatiana. German postcard by Film-Foto-Verlag, no. A 3826/2, 1941-1944. Photo: Wesel / Berlin-Film. German postcard by Film-Foto-Verlag, no. W 88. Photo: Berlin Film / Wesel. German postcard by Film-Foto-Verlag, no. G 151, 1941-1944. Photo: Wesel / Berlin-Film. 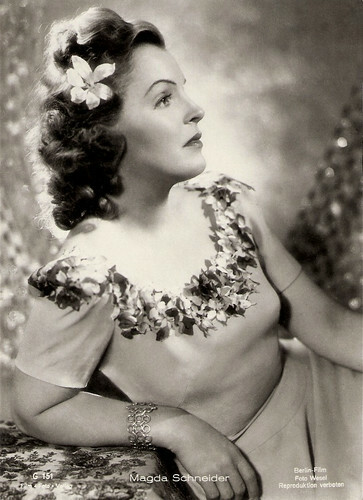 After the Second World War, Magda Schneider found that film offers were scarce, and she mainly appeared in guest roles on stage. The first post-war film in which she was seen was <1>Ein Mann gehört ins Haus/A man belongs in the house (Hubert Marischka, 1948), that was already filmed in 1945. In the 1950s, she got more film offers, but she decided to focus herself on the film career of her daughter Romy Schneider. 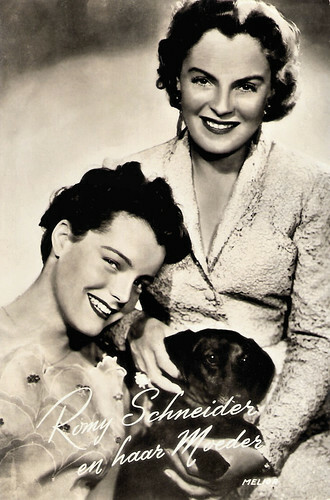 Mother and daughter appeared together in Romy's film debut Wenn der weiße Flieder wieder blüht/When the White Lilacs Bloom Again (Hans Deppe, 1953), Mädchenjahre einer Königin/The Story of Vickie (Ernst Marischka, 1954), Die Deutschmeister/A March for the Emperor (Ernst Marischka, 1955), Robinson soll nicht sterben/The Legend of Robinson Crusoe (Josef von Báky, 1956), and Die Halbzarte/Eva (Rolf Thiele, 1958). Best known of course is the Sissi Trilogy (Ernst Marischka, 1955-1957), based on the life of Elisabeth of Bavaria. 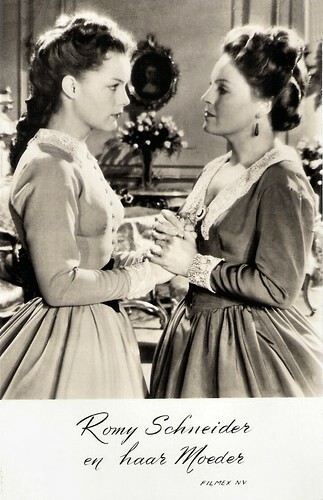 Romy Schneider starred in the title role and Magda Schneider played the role of her mother, Princess Ludovika of Bavaria. In 1953 Magda married Hans Herbert Blatzheim, a Cologne restaurant owner, who died in 1968. Her last appearance for the cameras was in the TV series Drei Frauen im Haus/Three Women in the House (1968) and the sequel Vier Frauen im Haus/Four Women in the House (1969). In 1982, Magda married cinematographer Horst Fehlhaber. 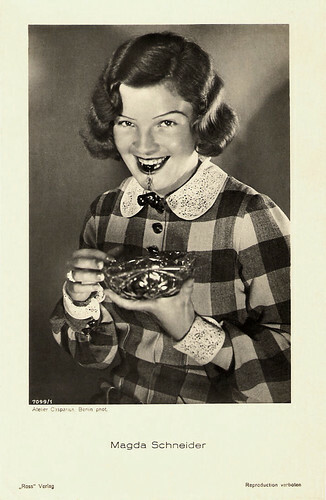 That same year she was awarded the Filmband in Gold. In the last years of her life Magda Schneider had to bear the tragic deaths of her grandson David in 1981 and of her daughter Romy in 1982. 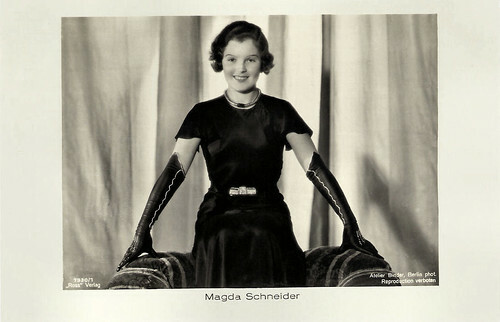 Magda Schneider passed away in 1996 in Berchtesgaden, Germany. She was 87. Lithuanian postcard by Izd. IRA, Riga. Dutch postcard. Photo: Melior. Sent by mail in 1957. Photo: publicity still for Wenn der weiße Flieder wieder blüht/When the White Lilacs Bloom Again (Hans Deppe, 1953) with Romy Schneider. Dutch postcard by Takken, no. 3092. Photo: Filmex NV. Publicity still for Sissi - Die junge Kaiserin/Sissi: The Young Empress (Ernst Marischka, 1956) with Romy Schneider. Dutch postcard by Gebr. Spanjersberg. Photo: Ufa/Film-Foto. 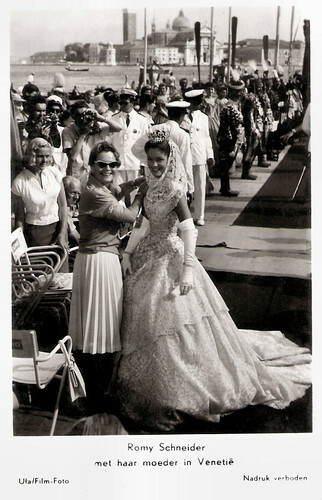 The photo was made during the shooting of Sissi - Schicksalsjahre einer Kaiserin/Sissi: The Fateful Years of an Empress (Ernst Marischka, 1957) with Romy Schneider. Final scene of Liebelei (Max Ophüls, 1933). Source: BD130. German trailer for Sissi - Die junge Kaiserin (Ernst Marischka, 1956). Source: UweundPiaFan (YouTube). Sources: Thomas Staedeli (Cyranos), Stephanie D'heil (Steffi-Line - German), Wikipedia, Filmportal.de (German), Fippi2000 (IMDb) and IMDb.